The growing popularity of faith-based films in the US isn’t a huge surprise, given how a large number of its citizens are religious conservatives who base most of their lives around the Christian faith, but what is shocking is how many of them are seen to be completely misrepresentative of the religion and its strong morals about being good to your fellow man. Films like God’s Not Dead, War Room, Let There Be Light and many others have oft been criticised for their hateful and sour tone towards women, people of little or no faith, and those who practise other religions outside of Christianity, without any hint of the good-natured agenda that the religion ought to publicise through the power of film. So when a Biblical epic that centres around one of Jesus Christ’s most known followers, a young woman by the name of Mary Magdalene, is released that actually does focus on the good messages that Jesus was known to teach, it’s something of an anomaly amidst all the other hateful Christian movies out there. Unfortunately, while Mary Magdalene undoubtedly has good intentions, it is a sad waste of potential that mostly squanders any of its promise with its pivotal female lead by being a mostly dull retelling of the Christ story. The film starts out with Mary Magdalene (Rooney Mara), a member of a Jewish family who expects her to cater to tradition, whose increasing lack of interest in this life leads her to listen to the word of the passing-through Jesus (Joaquin Phoenix), and eventually accompanies him and his disciples, including Peter (Chiwetel Ejiofor) and Judas (Tahar Rahim), across the country to spread the word of God. However, pretty much as soon as she sets out with Jesus and his holy entourage, she becomes more of a side character in her own movie, with much of the focus being on Jesus’ struggles with carrying out his mission as well as the personal torments and frustrations of the above-mentioned disciples, and with barely any interesting character arcs or even material for Mary nor Mara to work with at all, in a movie where she plays the titular figure. After years of being a lowly figure in the story of Jesus, largely being a supporting player in movies and shows depicting his later life, it’s confounding how little an impression Mary Magdalene leaves in a movie that finally promises to tell her story. You’ll walk out knowing just as little about her as you did going in, if not less so, and what little the movie actually dedicates to her life before following Jesus fails to make it interesting or provocative enough for us to be invested in watching it play out. Her pre-Jesus life basically comes down to every post-feminist Disney princess story ever; she comes from a family of pure tradition, is expected to marry someone she doesn’t love, ends up being ostracised by her family because of it, and goes on a journey of self-discovery with a bunch of colourful characters. The most surprising thing about it, in a film that is otherwise devoid of shocks and twists, is that it isn’t fully animated nor is it a musical; that’s how close to the Disney formula it feels, and it’s not even a Disney movie. Although Mara does her best with what little material she is given, as does Ejiofor whose acting prowess is completely wasted here in a thankless role of nothingness, it’s far more Phoenix’s movie than anyone else’s. He portrays Jesus as the prototype for cult leaders like Charles Manson, and because he’s an intimidating actor anyway it’s more chilling than soothing to hear these messages of love and compassion come out of this guy’s mouth. It’s memorable in the sense that Phoenix is most likely miscast in the role – Tahar Rahim, who plays Judas in the film, would probably have been a better fit for the character, in both looks and age (Phoenix is 43, ten years older than Jesus actually was when he died) – but he still gives it his all, even in a role he probably wasn’t meant to take on in the first place. 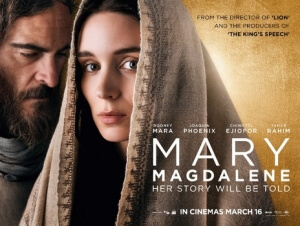 In a time when audiences are clamouring for more stories about prominent female figures in history, told with exciting and fresh angles that amplify the feminist call to arms, Mary Magdalene is a sore waste of potential, especially as it deals with the story behind one of the most famous women in Christian history, and doesn’t even acknowledge what made her so special in the first place. Mary Magdalene is a confounding waste of potential which gives very little reason for us to be invested in arguably one of the leading female figures in the New Testament, and does so in a very dull manner.